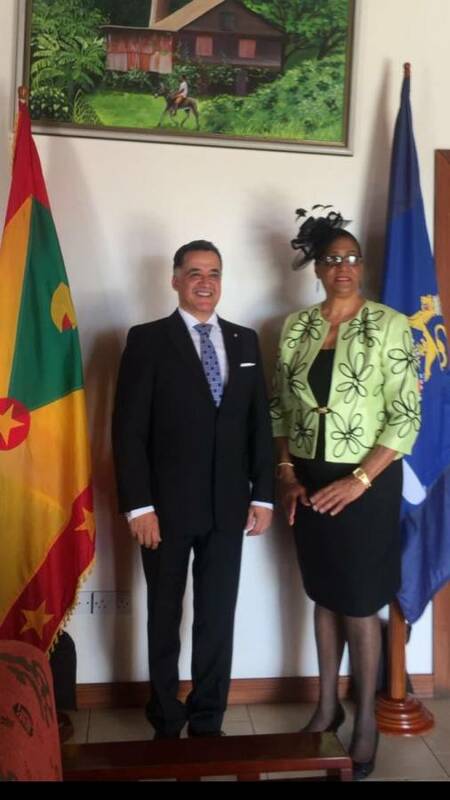 The Ambassador of Mexico to the Eastern Caribbean States, His Excellency Oscar Arturo Esparza Vargas, presented his Letters of Credence to Her Excellency Dame Cecile La Grenade, Governor General of Grenada on 14 November. During the ceremony, Ambassador Esparza, conveyed the compliments, as well as the message of friendship, prosperity and wellbeing of the President of Mexico, Enrique Peña Nieto, to the people and Government of Grenada. Ambassador Esparza took the opportunity to highlight the strong bilateral ties the 2 governments have held throughout the years in various areas. In particular, the ambassador addressed the cooperation Mexico provides to Grenada, most notably the donation of EC$13.5 million provided by the Yucatan Fund for the construction of the Parliament Building of Grenada, making it the largest contributor to the project. Additionally, Mexico donated a stone crushing machine in order to avoid the use of beach sand for construction, as part of a project for sustainable development. The Embassy of Mexico also collaborated in a project together with the Scientific Institute of Yucatan to provide 1,500 coconut plants resistant to the lethal yellowing disease. Ambassador Esparza also spoke about discussions held on the multilateral platform during the Mexico CARICOM Summit which took place in Belize last month where HE Dr the Right Honourable Keith Mitchell, participated in discussions to design the upcoming pathway of mutual collaboration in the fields of disaster management, de-risking, climate change resilience, and sustainable energies, among others. The Governor General of Grenada, Her Excellency Dame Cecile La Grenade expressed her gratitude for the many areas in which Mexico has contributed to the development efforts of Grenada, and reiterated the ties of friendship and potential for increased cooperation and commerce between the 2 countries. The ambassador took the opportunity to pay courtesy calls on the Acting Prime Minister, Hon Gregory Bowen; Minister of Foreign Affairs Hon Elvin Nimrod; Permanent Secretary and Chief of Protocol Alva Browne and Adrian Joseph in the Ministry of Foreign Affairs; Dean of the Diplomatic Corps, HE Jorge Guerrero Veloz, and Speaker of the House of Assembly, Honourable Michael Pierre. Ambassador Esparza looks forward to continue strengthening the ties of friendship and cooperation between Mexico and Grenada, as well as with the OECS as a whole.